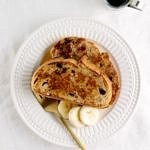 Banana french toast, a delicious way to start the day! Mix: In a flat bottom, shallow medium size bowl mash the banana until creamy and fairly smooth. Add the cinnamon, vanilla and optional nutmeg, mix well. Lastly, add in the milk and stir until combined. Pre-heat & Slice: Heat your skillet or griddle on medium heat. While griddle is heating slice your bread and gather your serving items. Dip: Using about 1 teaspoon of coconut oil, grease the griddle/skillet (do this each time you make add a new batch). Quickly dip bread into wet mixture and flip to coat the other side being not to not let the slices soak, or you may have soggy french toast. Cook: Place slices on griddle/skillet and cook about 3 minutes on each side, or until golden on both sides. If slicing into thick slices you may find that you’ll need a little extra time to completely cook the center. Serve with pure maple syrup and fresh fruit of choice.